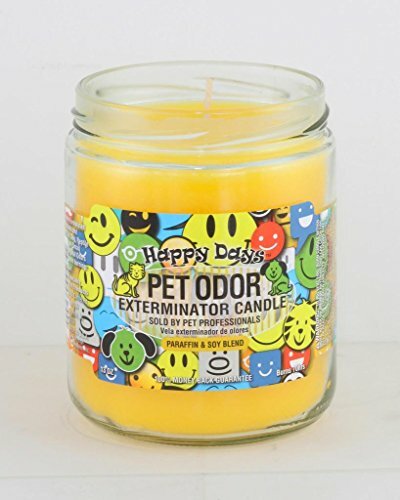 Pet Odor Exterminator Candle, Happy Days These odor exterminating candles not only look attractive and smell fantastic, but more importantly, their unique enzyme formulation attacks and removes pet, smoke, and household odors. Bursting with fruitiness, Happy Days is a sweet blend of lemon, mango, peach, mandarin candy, pineapple, wild melon and vanilla. It's an explosion of happiness! These candles have a 100% money back guarantee if they don't successfully remove odors. How it works: The special enzyme formulation will remove the odors while leaving a refreshing fragrance behind, and burn approximately 70 hours. Burn Instructions: Trim the candle wick to 1/8" before lighting. Always burn the candle on a heat resistant surface. Burn candle within sight, never on or near anything that can catch fire For the best results, burn 3-4 hours and extinguish. Do not let matches, wick trimmings or debris accumulate in the jar. If flame smokes, extinguish and trim wick to 1/8" before relighting. NEVER leave a burning candle unattended. Made in the USA! Beautifully Crafted Fragrances That Will Make Your Home A Pleasure To Be In. Removes Cat, Dog, Small Animal, Smoke & Household Odors!